Your hardwood floor is an investment in your home. Its natural beauty will grow over time but only if you take the time to properly care for your hardwood floor. 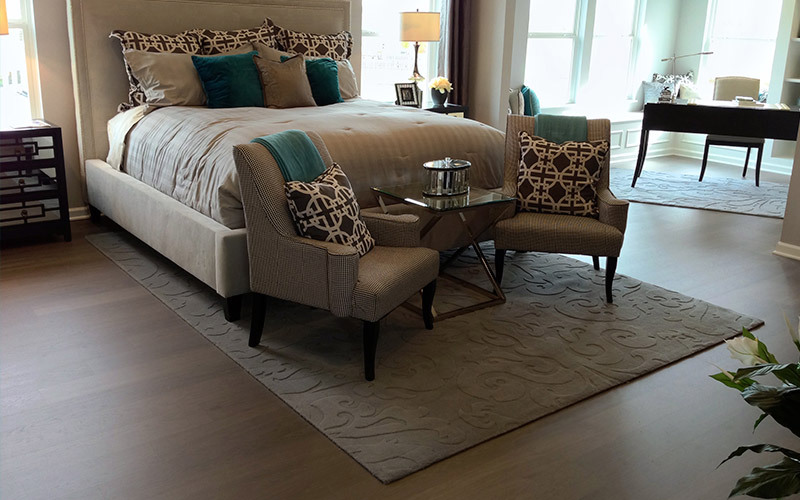 Don't worry, hardwood floors aren't high maintenance! There are a few simple things you can do regularly to keep them at looking their best. Over time, dirt tracked in on your shoes can damage the surface of your floor. The best solution? Remove that dirt regularly! Sweep or - even better - use a microfiber dust mop to remove dirt, particles and dust from your floor. Plan to do this a few times a week or even daily if you have a lot of people or pets walking on your floor. Daily dusting will keep most of your floor clean but you need some deeper cleaning to take of the dirt in the corners or grooves between your hardwood planks. That's where a vacuum or mop does the best job. Just remember that you can't vacuum your hardwood floor the same way as your carpet and you can't mop it the same way you would a tile floor. Vacuuming your hardwood can damage the floor if your vacuum has a beater bar or power brush. Make sure the brush is not spinning or use a separate vacuum attachment made for hardwood floors. Do not use a traditional wet mop on your hardwood floor. Water will damage the wood. Use a microfiber mop and lightly spray a hardwood floor cleaner to help pick up extra grime leftover from your daily dry mop. In addition to regular cleaning, these tips from the hardwood flooring experts at Kermans can help keep your hardwood beautiful for years to come. Install door mats and remove your shoes before walking on the hardwood floor to help reduce the amount of dirt that is tracked in. Keep your pets' nails trimmed to reduce scratching. Use a humidifier when your heat is running to help reduce wood shrinkage. Wipe up spills immediately with a clean dry cloth. For more cleaning guidelines and tips, turn to Kermans free Hardwood Floor Care Guide. Which types of floors are best for those with allergies? Solid hardwood vs laminate wood flooring: which is right for you?